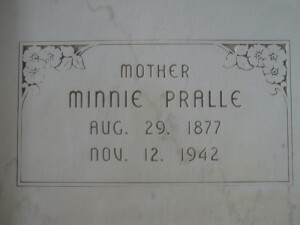 Mrs. Louis Pralle, nee Minnie Mausehund, was born, August 29, 1877 near Peotone. 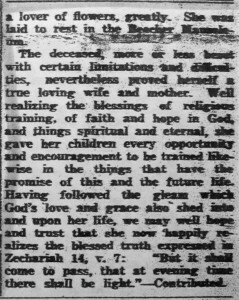 The child of Christian parents, she was soon after birth received into the family of the children of God through Holy Baptism in St. Peters Church, Frankfort. On October 18, 1897, she was married to her now sorrowing husband, Louis Pralle, the ceremony being performed in Chicago. Soon after marriage, the young bride took private instructions and was confirmed by the late Rev. G. Koch. Making their home on a farm, two miles southeast of Beecher, the young couple was blessed with six children, of whom one in infancy preceded the mother in death. The surviving children are: William, Beecher; Esther, Mrs. Ed Matthias, Beecher, Lydia, Chicago Heights; Leo and Alice at home. Greatly handicapped as to full enjoyment of life, the departed never complained, but lovingly and loyally performed the numerous and varied tasks of wife and mother. Even during the last three years when an incurable disease made itself known and felt so that she had to force herself to be up and around she persisted in carrying on as long as she possibly could. When the best of medical attention and skill gave but little or no hope for recovery the thought and certainty of approaching death did not upset her. Thus when the hour of her departure struck on Thursday, October 12, at 8:30 a.m., she peacefully went to sleep at the age of 64 years, 2 months and 13 days. She leaves to mourn her passing, her husband and children already mentioned, her aged mother, Mrs. Henry Mausehund, Peotone; three sisters, Christina (Mrs. Charles Van Horn), Kankakee; Emma (Mrs. Joseph Manning), Peotone; Anna (Mrs. Earl Tabbitt), Kankakee; eight brothers, Paul, North Dakota; Henry, Iowa; Walter, Minnesota; George, Peotone; Harold, Peotone; Martin, Kankakee; Emil, in the armed forces; John, Peotone; and a host of other relatives and friends. Funeral services were conducted, November 15, beginning at 1:30 p.m., at the Hack Funeral Home and continued at St. Luke’s Church, where their pastor, Rev. G. Horst, spoke consolingly in both the English and German languages; Mrs. Ervin Albers, Mrs. George Ostermeyer, Mrs. Arthur Boysen and Mrs. Harry Fick, rendered three appropriate songs. Gorgeous floral pieces, surrounding her casket, would have pleased her, a lover of flowers, greatly. She was laid to rest in the Beecher Mausoleum. Other, more distant family include: Bahlman, Batterman, Bergmeier, Beseke, Bielfeldt, Bohl, Cloidt, Dunlap, Engleking, Fenske, Fick, Fiene, Freerking, Frobose, Graham, Guritz, Hack, Hager, Haltenhof , Heine, Heldt, Hildeman, Hinze, Hoffman, Hoppensteadt, Horn, Hunte, Kaczynski, Kappe, Kilborn, Kirchhoff, Koch, Langreder, Leder, Maass, Matthias, Mc Carty, Meyer, Monk, Niedert, Ohlendorf, Pansa, Peters, Riley, Ristenpart, Rohe, Rust, Saller, Selk, Struve, Thielman, Vagt, Von Engeln, Wegert, Wehmhoefer, Wiechen, Westphal, Wilkening.